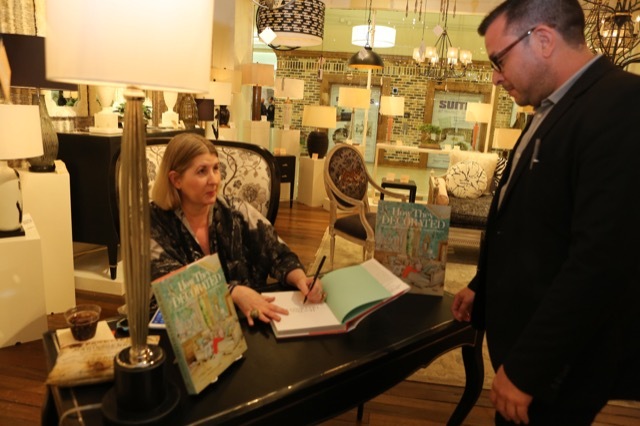 P Gaye Tapp Signs Books in the Currey & Company showroom at April Market. It’s official: those of us who braved another High Point Market have lived to tell, and what a roller coaster ride it was! I always look forward to the events and book signings in the Currey & Company showroom but I must say the design verve this go-around was just short of a material obsession. 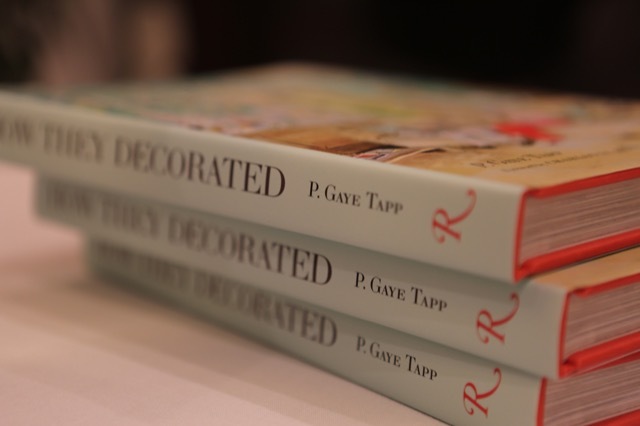 I couldn’t resist snapping up a copy of P. Gaye Tapp’s How They Decorated and I enjoyed being able to chat with an author who is as fascinated with design history as I am. “How They Decorated” awaiting signatures and avid readers. 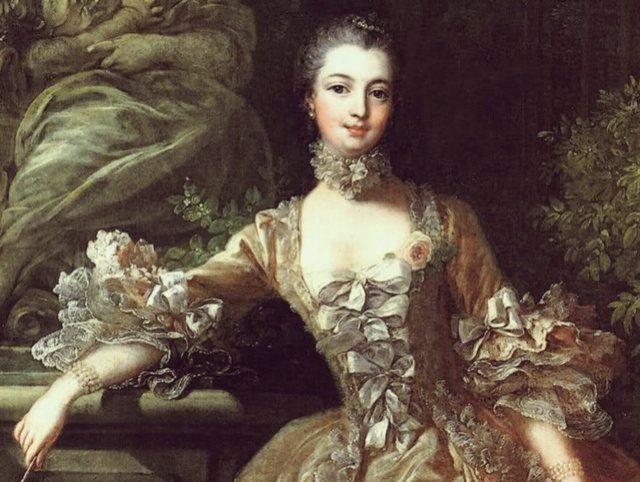 A portrait of Madame de Pompadour. In the chapter that follows, he describes the Little Cabinets, the space the King carved out for himself that preceded his loftier petite apartments. These private quarters were on the north side of the Marble Court, and the interiors held elegant exemplars of the faultless craftsmanship of the eighteenth century. “Here the sun streamed in through the tall windows,” Smythe wrote, “turning the pendants of the chandeliers to drops of fire and imparting an airy lightness…” The author notes how these bright spaces were in striking contrast to the cheerless magnificence of the state apartments that the King had abandoned. 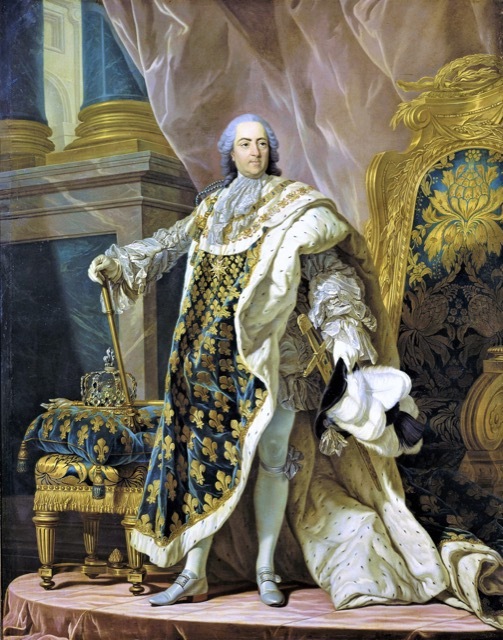 A portrait of Louis XV, one of the House of Bourbon’s most avid design enthusiasts. The Petite Apartments of Louis XV. 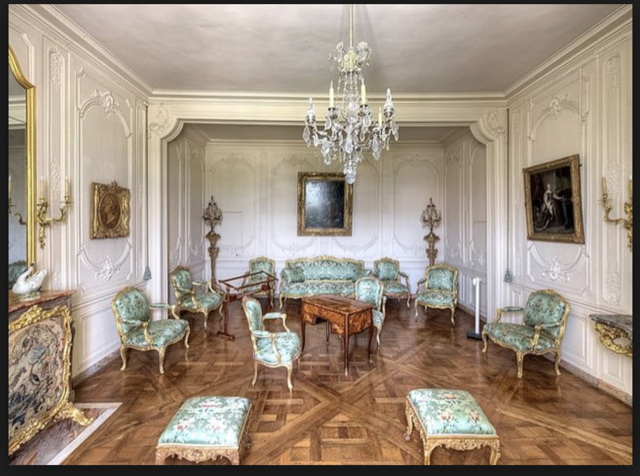 This incident prompted the King to design his most private petite apartments, a maze of winding corridors connecting a series of rooms and secret staircases nestled into the mansard roof that looked out onto an inner courtyard called the Cour des Cerfts. Here he kept his treasures and dined only with his closest friends. The décor, which he chose himself, revolved around pale grays and a delicate shade of translucent green called vernis Martin. “The furnishings were costly but of restrained simplicity, fitting for the luxurious hideaway of a very rich man who could indulge every whim,” Smythe writes. These whims certainly included the obsession around surviving. 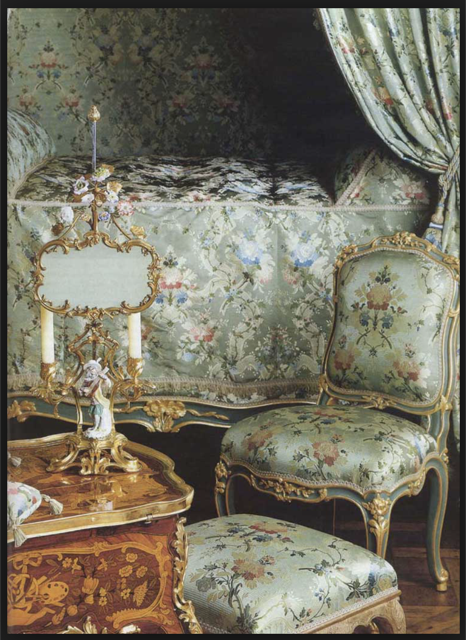 Madame de Pompadour’s apartments at Versailles held her triumphal dressing table. The Marquise’s apartments at Versailles were nearby. “The shell motif of Verberckt’s woodcarving was simple and elegant,” Smythe adds, “and the mantels, which are still there, were of marble. Long pier glasses, placed on one side of the room, reflected the Beauvais tapestries which ornamented the opposite wall.” Looking at the images, it’s clear the boiserie was indeed exemplary and her furniture graceful, the chairs wide to accommodate the panniered dresses the women of the court wore during her era. Her dressing table set with its mirror, shown swathed in lace above, was deemed a “triumphal piece of furniture” not unlike an altar. 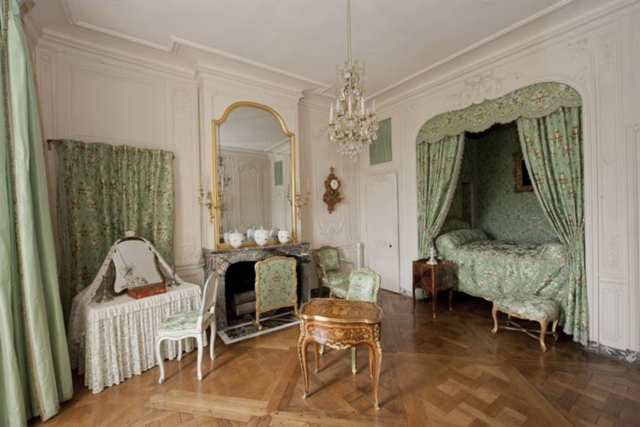 Madame de Pompadour’s apartments at Versailles were sumptuous. This was a sumptuous example of a “woman’s independence at home,” to quote Moss, the Marquise’s bed sheathed in silks and lace, the alcove enveloping it similarly adorned. But she was, of course, only partially independent, as her presence there was at the mercy of the King. Though it may be easy to imagine her quality of life as being of the finest order, consider the fact that the cosmetics she used, which Smythe accounts in detail, contained poisonous red lead and mercury that burned her skin and caused headaches, which the obsession to be beautiful fostered. Let’s just say those rosy cheeks didn’t represent the continued blush of youth as some might assume! 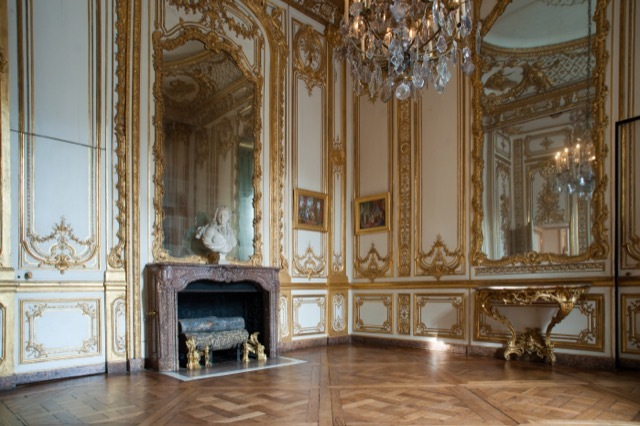 Madame de Pompadour’s apartments at Versailles glinted with gold. “In spite of the splendor and comfort with which the Marquise was surrounded, in spite of her triumph, or more likely because of it, the strain told,” Smythe reports. “To walk the tightrope of Versailles, where nearly everyone schemed for her downfall, would have overwhelmed a woman more robust than she.” These hardships have inspired me to take Madame de Pompadour from the golden cage, give her a modern life in which she can relax, and provide her with a few great pieces of furniture harkening back to the gleaming metal each monarchy claimed as its own. 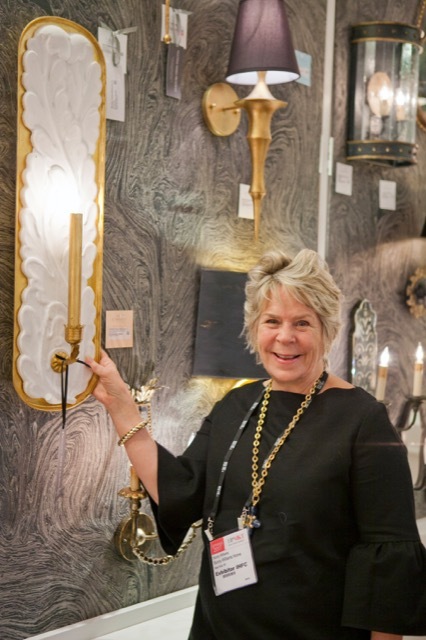 Bunny Williams with the Weslyn wall sconce in her new collection for Currey & Company. 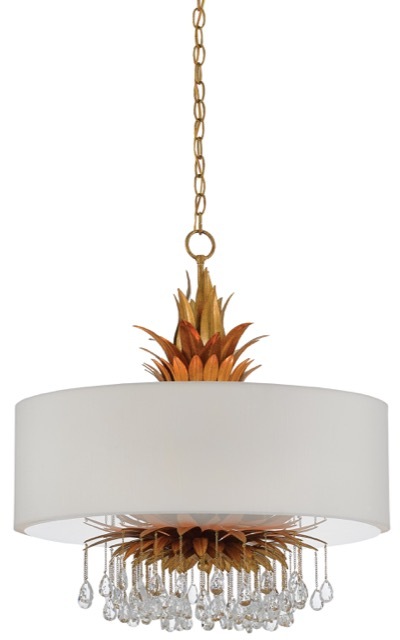 Weslyn sconce in the Bunny Williams Collection for Currey & Company. 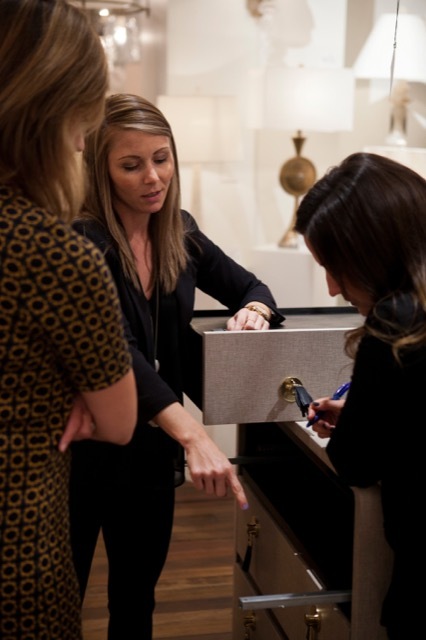 Aimee Kurzner demonstrating the workings of a piece of furniture during High Point Market. 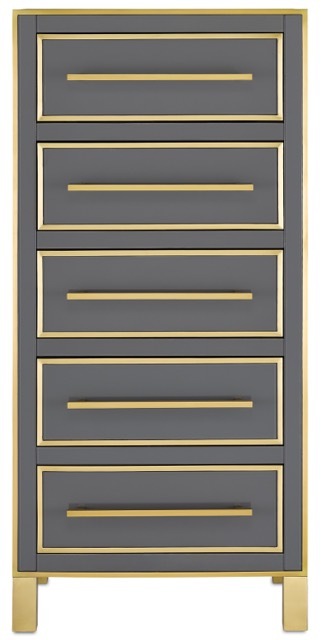 Along with the Weslyn sconce, I envision in Madame de Pompadour’s modern digs a few of Currey & Company’s new releases and best sellers below. Don’t you think they’re perfect? 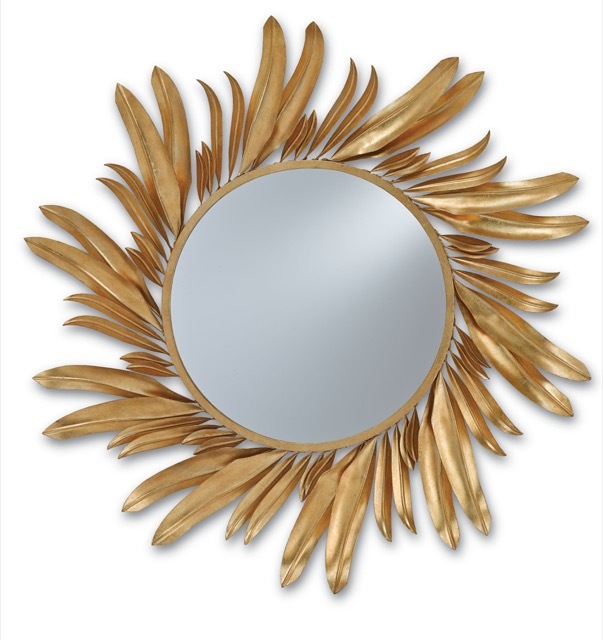 Wrought iron petals fan out gracefully from the circular center of the Folium Mirror, calling to mind a sunflower or an exploding star. The brilliant contemporary gold leaf finish enlivens each frond. 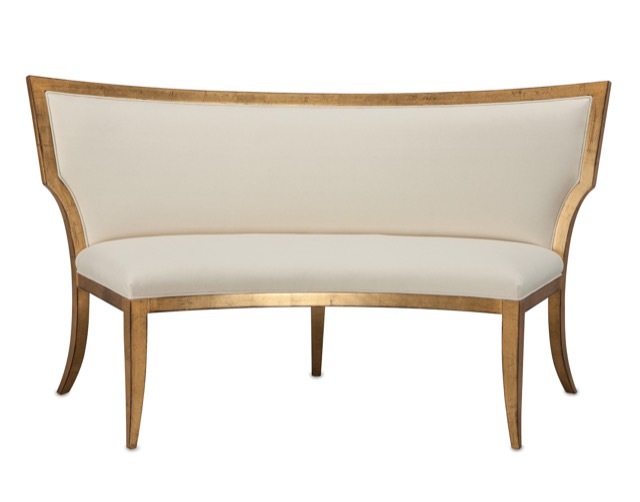 The Garbo Banquette echoes the past but with its own modern sensibilities. Shown here in muslin, the fabric options are plentiful. Like the “pendants of the chandeliers” in Louis XV’s petite cabinets, light would turn the Vivienne chandelier’s crystals to “drops of fire.” The design, which also has leaf accents in a gold finish that would be perfect for a Madame, is a new bestseller. A woman of Madame de Pompadour’s stature would certainly be in dire need of the Arden lingerie chest were she making the rounds of parties today. The reverse painted glass panels trimmed in brass make this piece hit all the right style notes for a woman who harbored the obsession she was the most beautiful femme in France! The summer market season is upon us so I thought I’d give you a list of Currey & Company events coming up as the sun climbs higher in the sky to illuminate our interiors with greater intensity. Happy designing everyone! Dallas Total Home & Gift Market gets underway from June 21-27. We’ll be glinting in WTC Suite 10000! The Atlanta International Gift & Home Furnishings Market will take place from July 11-18, and we’ll have all of our best sellers and new products on display in Building 1, Suite 14F10. Las Vegas Market will get the party started on July 30 and last through August 3. You can find us in Building C, Suite 398, so do stop by if you’re in town! This entry was posted in Currey & Company, History, Market, Products and tagged book signing, cabinets, Chandeliers, design influencers, Gold, Gray, Lighting, mirrors, Modern, seating, Wall Sconce, White on May 16, 2017 by Currey & Company. You’re most welcome, Robert! This was a fun one to write!